Even with the existence of instant messaging apps that are faster and more convenient in terms of access and the time it takes for the message to reach the receiver, writing emails is still preferred by many since it is the next best thing to formal communication. When wanting to communicate with people in a rather formal manner, the email is the best choice while still keeping it accessible and time-efficient for both the sender and the receiver. You may also see Sample Email Signature. In addition to writing emails, you can either write your name manually at the signature line, but you will need to do this every single time when you compose an email. To make it easier for you to write your name, you can make use of the email signature feature, which is present in most email apps. This way, your name and other relevant details will automatically be included on the bottom portion of your email when you compose one. 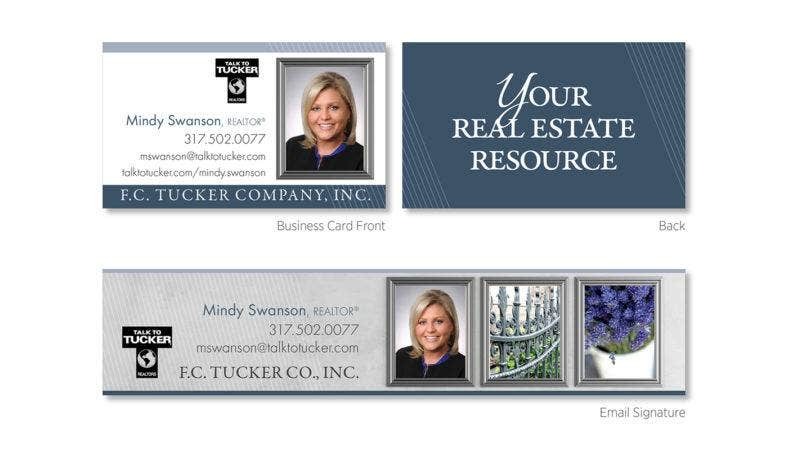 Check out the formal email signature template above that you can use whether or not you are a real estate agent. For this template, you may be able to edit it using Adobe Photoshop, though you may also be able to convert it to an HTML file for easy uploading on your email account. But you can still be able to take it a step further. Instead of just a regular text that displays your name, your designation, and probably your contact details at the end part of your email, you may also add a bit of creativeness to it. Stressful, you might think, but it’s actually a piece of cake with the help of our templates. 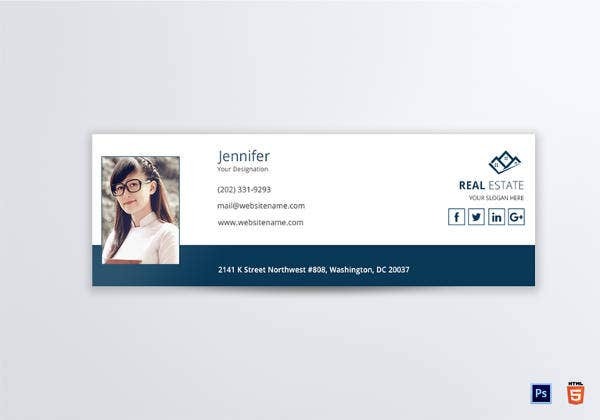 Below are various realtor or real estate email signature templates that you can download and use as your own, some are even multipurpose and can be used by those from different professions. If you want to check out the templates yourself, go ahead and start scrolling down. Above are three different themes of real estate email signatures that you can choose from. Whichever theme you want to use, you may still be able to edit the design, so don’t worry about it if what you see above isn’t quite what you expected. You may also see personal e-mail signatures. What Is Real Estate All About? When we hear the word “real estate”, the first thing that we can associate it with are houses, buildings, and lands, but there is a more definitive explanation for this profession. Real estate is defined as the property that consists of the land itself and the structures built on it, and it also includes the natural resources over it such as plants, crops, and bodies of water. 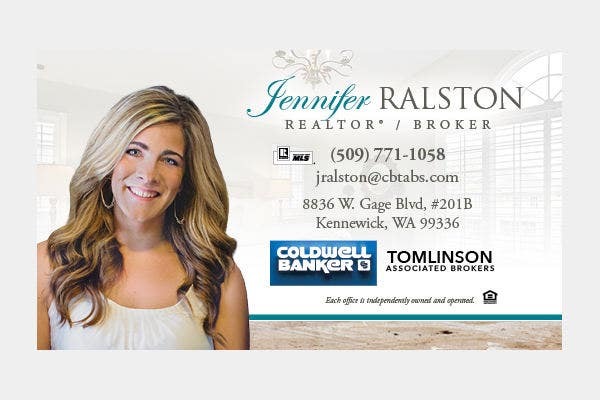 The real estate agent—oftentimes referred to as a real estate salesperson or broker—is a professional who assists owners in selling their property, as well as buyers in finding the property that suits their budget and preferences. Basically, a real estate agent serves as a middleman whose job is to help buyers and sellers meet halfway in terms of properties. If you are looking for something that is more up to date with today’s standards, then the sales email signature template above may be what you are looking for, but it may be a little pricey. Unlike the more inexpensive ones in this collection, the template above requires very minimal editing. Basically, it’s almost a “what you see is what you get” kind of thing, though you may still need to customize the image and the information fields. By definition, an email signature is a text block that is attached at the end portion of an electronic mail where the sender’s signature line is usually located. Ideally, an email signature’s purpose is to provide the recipient with the name of the person who sent them the email, along with some contact details. But nowadays, email signatures have also been used to provide readers with an initial impression of the sender, informing the former with the nature of the latter’s profession. Many of today’s email applications already have this feature, and the owner of the email account can either make their signatures out oa f pure text, or they can also incorporate graphical elements with the text. But for those who are knowledgeable in graphic designing, they can take advantage of their skills and design their email signatures using graphics editing tools. Then end result will usually be in a graphics format, and they may be able to upload this as their default email signature. Do you prefer a slightly vibrant-colored email signature to help it stand out and be easily noticed? If you do, then you may want to check out the company email signature templates above. Simply choose which colors suits you best and download it. However, if you prefer something more simplistic, then this bundle of templates also has a grayscale-themed design that you may want to check out as well. What Are the Basic Elements in an Email Signature? There may be a lot of questions on your head right now regarding the content of this article, such as “what is an email signature template?“, or “why do you need to make an email signature?”. Those questions will be answered as you go along, but for now, let’s talk about the elements found in an email signature. The most important information that you should include on your email signature is, of course, your complete name. If you have a suffix that you would like to include, you may do so. You may also see mobile e-mail signatures. Below your name is your title or designation and the company that you are representing, unless you are working as a freelance professional. Once those two priority information have been added, the next set of details that should be included are the contact information. When talking about contact information, this should consist of at least one phone number, which can either be your personal number or your company’s. If you have a fax number, you may also include it on this section. You may also see outlook email signature templates. The use of social media has extended beyond personal reasons, and many industries and organizations have took advantage of these in order to make themselves known. For email signatures, you may be able to add links to your business’ social media pages, if it has one. 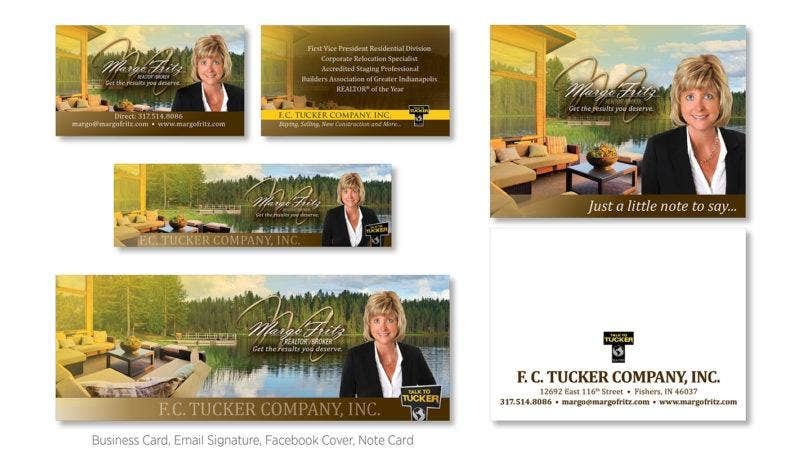 For most email signature templates, there is usually a space provided for you to add an image. You may either use this space for adding your business’ logo, or you may also use it for adding your own portrait photo. 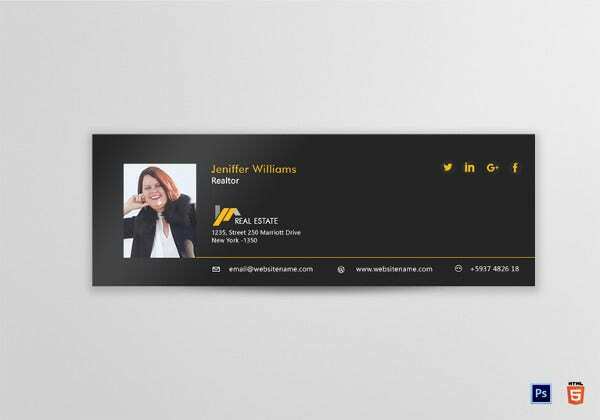 We also have a dark-themed real estate email signature template that you may also be interested in. Check out the template above, the elements included are very minimal and are arranged very well to easily distinguish the different details indicated on it. Another advantage of using a dark-themed email signature is that it easily stands out from the white-colored interface. What Are Some Tips When Making and Using Email Signatures? 1. As much as you want your email signature to be informative and effective, you wouldn’t want it to end up looking cluttered and confusing to read. Which is why when you are still in the process of making your own email signature, always take note that simplicity will always be the safest bet. Keep your design simple and include only the most relevant information. If you have multiple phone numbers, indicate only one to avoid confusion. You may also see corporate email signatures. 2. A logo on the email signature may not be necessary at all times, unless your company requires you to use it. But what you should do is add a photo of you on your email signature. This way, the recipient of your email will already be familiar with how you look like. You may also see HTML email signatures. 3. Use colors, and don’t be ashamed of using them. 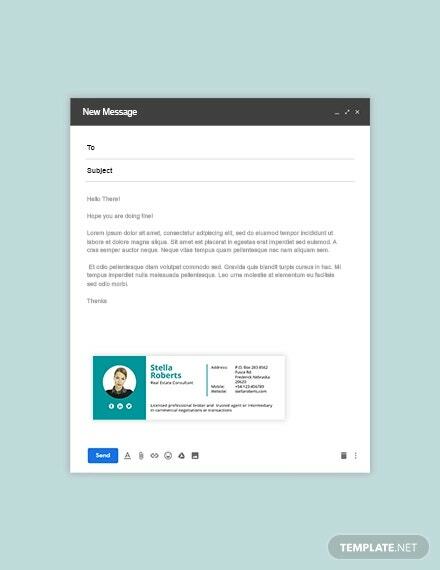 As mentioned earlier, email signatures have now been used to draw attention from people, which is why you should make it as attractive as you can while still keeping it professional. You may also see modern charity HTML email signatures. 4. Take advantage on the use of social media. Yes, we did mention earlier that simple business have already taken advantage of social media in order to reach a larger number or people. But for you, especially if the company that you are working for allows you to design your own email signature, include it on the design. Don’t underestimate the benefits of social media towards businesses. 5. Proofread all the details that you have put into your email signature, make sure that the spellings and the contact numbers are correct. If changes have been made in relation to the business, then you should also update the contents of your email signature. 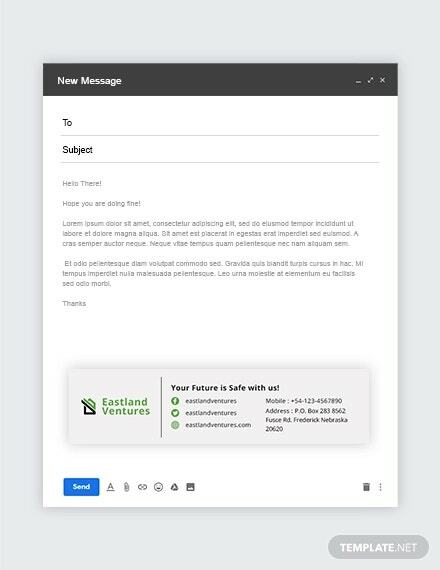 You may also see fitness email signatures.Just like the rest of the multipurpose templates that you have seen in this collection, you may be able to share this with others who are in need of email signatures, regardless if they are working under a real estate office or not. Judging by the fact that you have reached this point in the article, we assume that you have seen every single template in this collection, and we are hoping that you were able to find one that you could use for either your work or personal email account. 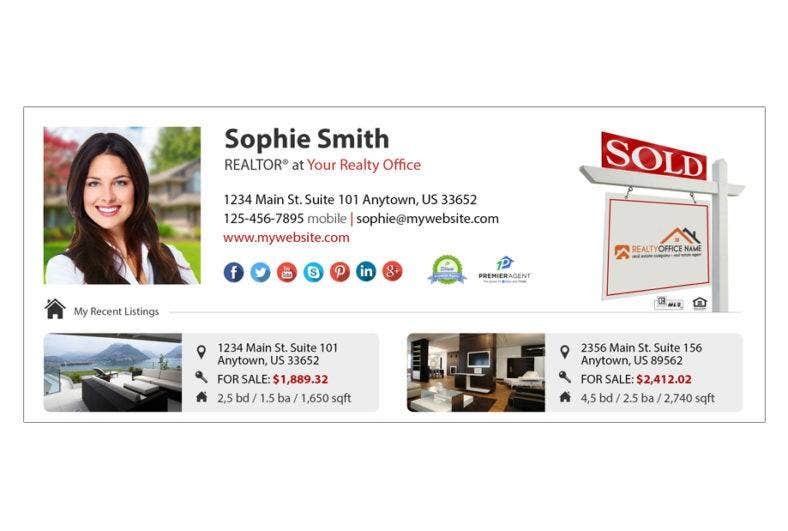 These marketing email signature templates were designed by professional graphic artists, and these were made to cater to professional real estate agents, brokers, investors, or anybody working under a real estate company. 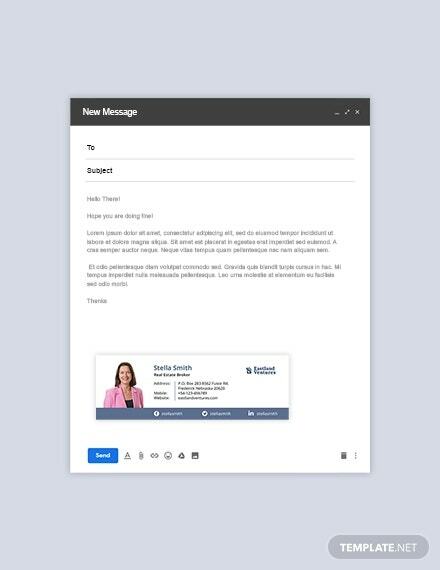 But as mentioned earlier, many of the templates in this collection are multi-functional, which means that even those from other professions may be able to use the email signature templates available here. Obviously, these templates will need to be edited before you can actually use them. You will need to change the required fields to fill them with your own information. Since this represents you as a professional and someone who should be trusted by both prospects and clients alike, you should always be honest with the detail that you include on your email signature. If ever changes are made with regards to your position or the contact details that you have entered, you should always update your email signature so as not to mislead the recipients of your email. You may also see sports email signature templates. And, if you’re concerned whether or not downloading the templates here may cost you a lot, it may be true in some cases, but you can always use the inexpensive ones. 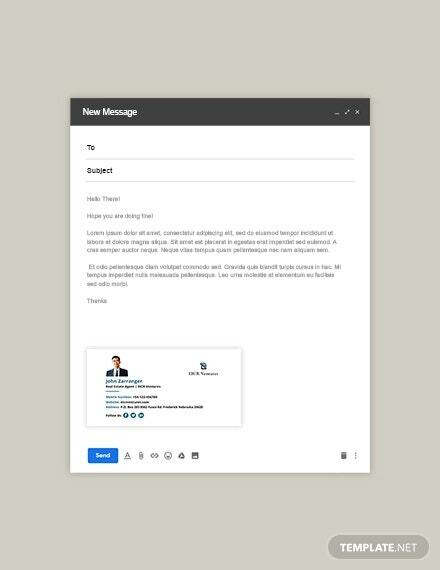 We guarantee high quality email signature templates here, even the cheap ones are just as exceptional as the pricey ones, but they the former may require a little more editing and enhancing than the latter, but that doesn’t mean the quality is poor. For as low as $3.00, you can already get your hands on professionally-made email signatures, and these are already enough especially if you are still establishing. But if you’re already quite experienced, then you can invest on the pricier ones. Nevertheless, we hope you’ll be able to find the business email signature design that you need.